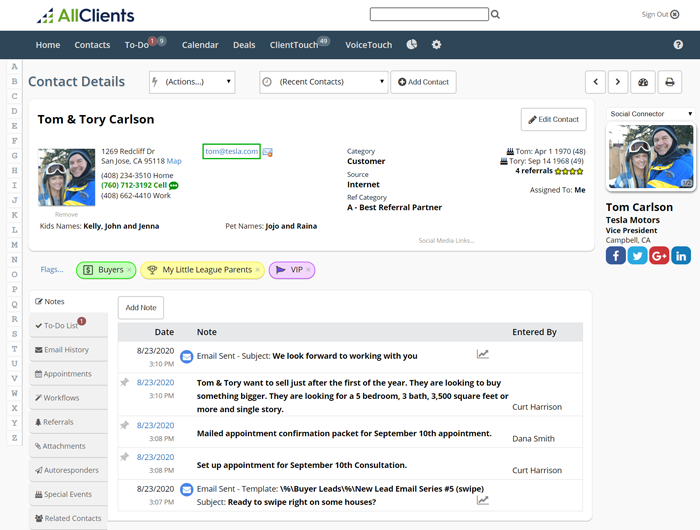 See all of your client's info on a single screen. Contact info, notes, to-do's, appointments, and more. No more searching from screen to screen, looking for that one piece of information you need. OK, so you have 500 contacts in your database...now what? Imagine if you could filter that list by "Hot Prospect", or "Past Client" or "Golf Buddies" or "San Jose Residents", etc... you get the idea. In AllClients you can categorize and flag your clients anyway you want to, create your own custom fields and then easily sort and segment your list in seconds. Great! 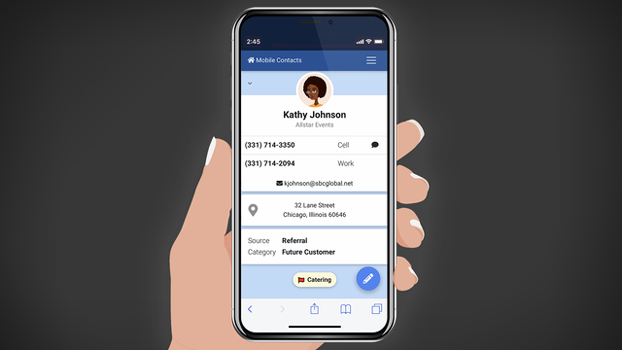 With the Easy Contact Filtering feature you were able to easily filter your database and you have a group of names in front of you ...now what? 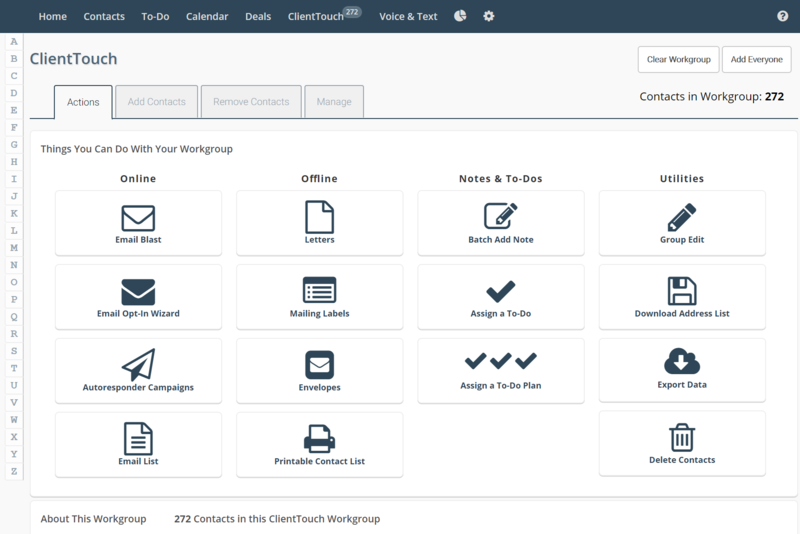 With AllClient's invention: ClientTouch, in one or 2 clicks you can send that group a letter or email, print the list, create mailing labels, edit something in their contact records, assign a to-do, and more. AllClients To-Dos and reminders make it easy to follow up with your customers and clients. When you need to call them in 6 months to remind them to do business with you, AllClients will remind you on the right day and keep reminding you until you get it done. It is heart breaking when you realize you lost a big deal just because you forgot to follow up. Ever try to mail-merge your contact info into a letter in Excel or Word? AllClients makes this process a snap. Your letters and emails look professional, custom, and you can do it yourself in seconds. Keep track of your appointments in our easy-to-use integrated calendar. 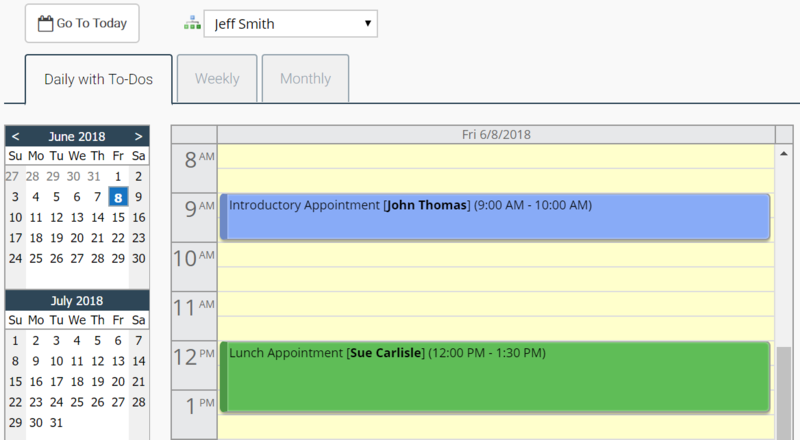 See daily, weekly and monthly views, drag and drop appointments, and even see and view your contacts from within the calendar. Take your contacts, appointments and to-dos everywhere you go.